Long time environmental advocates, researchers and a horticulturist shared their experiences and thoughts on what we need to do to protect life as we now know it on the planet. This was a wide-ranging discussion on connecting the dots between nature and health. We wanted to explore leading a virtual conversation between four friends about their work on the environment for the environment. We also want to see whether or not an informal one-off e-conversation would be interesting to e-audiences. "Listen in" on our e-Dialogue forum as these four discuss what they are fighting for, what sustains them personally, as well as their fears and hopes for the future. Visit Nature Canada to learn more about their NatureHood Program. Biodiversity Conversations: How Important are the Common Loon and Polar Bear to Canadians? Moderated by Professor Ann Dale, co-chair of Women for Nature, and in partnership with Nature Canada's Women for Nature initiative, this curated series of real-time virtual conversations ran over a period of 8 months, beginning in September 2017. Never has the protection of biodiversity been more important as the 2016 Living Planet Report revealed that 67% of wild animals will disappear by 2020. Furthermore, the Canadian government recently made an international pledge to conserve at least 17% of our lands and inland waters by 2020. Given this step forward, these conversations were even more timely as we had the opportunity to mobilize around this critical issue and explore how to continue to protect our ecosystems and significantly expand our protected areas. By convening female researchers, practitioners and civil society leaders from diverse sectors across the country to stimulate ideas, dialogue and local actions, we identified and discussed strategies to help inform decision-makers as well as the Canadian public. 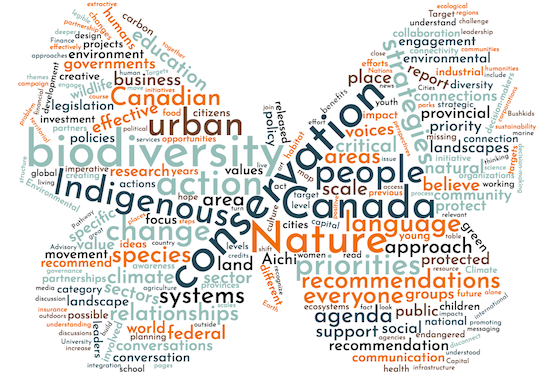 Designed to increase civic awareness, engagement, and literacy on the importance of biodiversity conservation for all Canadians, this series explored the following questions: why is biodiversity important to Canadians? ; what are the drivers and barriers for conservation? ; how important are Canadian icons such as the common loon and polar bears to Canadian society? ; most importantly, what can we do individually and collectively to protect it? Interested in learning more about biodiversity? Visit our curated biodiversity resource library. What is Biodiveristy and Why is it Important? Panelists began with a broader discussion on the nature of biodiversity conservation, before moving into more specific issues. They explored the critical relationship between human well-being and biodiversity, focusing on diversity as a general theme, as well as the current state of biodiversity loss in Canada. They discussed why it is imperative for Canada now, looking at the 2016 Living Planet Report, the state of North America’s Birds 2016 and the connection between biodiversity conservation and regenerative sustainability. From the Local to the Global This conversation used the monarch butterfly to illuminate the local to global interdependencies of biodiversity conservation. Panelists revealed the dynamic interconnections and the need for global governance systems essential to protecting critical habitats and migratory paths. Biodiversity, like climate change, does not respect political borders and requires a broader systems approach for its conservation. Drivers and Barriers This conversation focused on the drivers and barriers to the national, regional and local resolution of biodiversity conservation as biodiversity conservation is an issue that requires work from multiple scales. Panelists also explored what Canadians can do in their day to day lives to help protect and preserve biodiversity, individually and collectively. Where Do We Go From Here? This conversation brought forward recommendations from the previous three to develop more concrete on-the-ground actions. Following this conversation, an action agenda sharing ideas from the 40 e-panelists and e-audience members will be released in September 2018 for Canadian decision-makers in all sectors. Imagine if we design with biodiversity in mind, the possibilities that would open up. According to the latest Assessment Report from the Intergovernmental Panel on Climate Change (2014), the last three decades have experienced a clear increase in the Earth’s surface temperature, and it is likely that 1983 to 2012 was the warmest 30-year period in the Northern Hemisphere within the last 1,400 years. In direct response to this evidence, a collaboration of over 60 scientists from every province and across disciplines came together in the Sustainable Dialogues Canada, led by Dr. Catherine Potvin from McGill University. The scholars within this collaboration brought their knowledge and research to collectively identify a sustainable climate pathway for Canada. The consensus action agenda, Acting on Climate Change: Solutions from Canadian Scholars, launched in March 2015, identifies ten policy orientations and actions that could be immediately adopted to kick-start Canada’s necessary transition toward a low carbon economy. The Climate Imperative e-Dialogues series followed this work and delved deeper into the solutions for moving toward a low carbon economy. Post COP21: Next Steps A wide-ranging conversation on the next steps Canada should take if they are serious about their commitments as a signatory to COP 21. What about oil and gas subsidies? How do we create a level playing field for industry to move forward? What are the necessary innovations? Is a carbon neutral economy by 2050 even possible? Canadians Vote This conversation explored different scenarios, which depict likely outcomes from three different development pathways. The time is ripe for the federal government to step up and stimulate ‘changes’ to move Canada towards a low-carbon economy and sustainable society; however, this begs the question, what kind of change is necessary? Canadian Voices In this conversation, Sustainable Dialogues Canada scholars discussed about what they learned from Canadians from 14 visioning workshops across the country. Do we have a consensus on the way forward, what are the points of convergence and divergence? The Provincial Context This conversation brought together scholars and experts to dialogue about climate action in the provincial context. Which provinces are leading the way and in what ways? What other leadership innovations exist for trying to reduce our climate impacts in Canada? With provincial leadership, is the federal government even needed? The Art of the Possible This first conversation of the Climate Imperative e-Dialogue series focused on the ten policy orientations featured in Acting on Climate Change: Solutions from Canadian Scholars, and it explored the steps Canada can take now to achieve a low carbon economy. 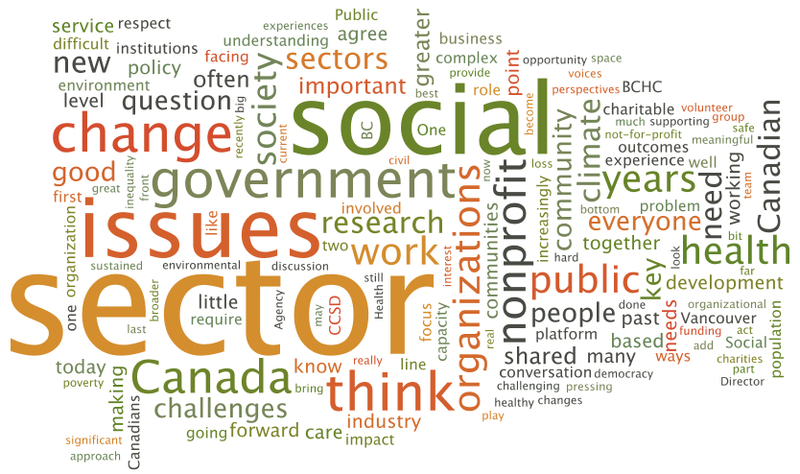 Revitalizing the Social Sector examined critical developments in the non-profit sector serving communities across Canada. This series brought together sector leaders to tackle four critical questions. Where have we come from and where are we headed as a sector? Where do our leaders come from today? What do we need for scaling out and up? What do we need for revitalization? Click on the title to download a copy of the entire conversation. The word clouds next to the dialogue capture the dominant ideas that emerged from the e-discussion (sized by number of references), and can be expanded by clicking on the image. Canadian charities and non-profits rely on many sources of revenue. Nearly half of revenues for non-profits (excluding hospitals, universities and colleges) come from earned income sources such as the sales of goods and services. Indeed the pressure to expand earned income continues to grow in the face of fierce competition for individual and business donations and declining government support. The type of funding on offer is problematic as well. Fifteen years of short-term, project-based funding, with slim to non-existent margins for administration, has taken a huge toll on community organizations, and significantly reduced capacity for public communication and research. 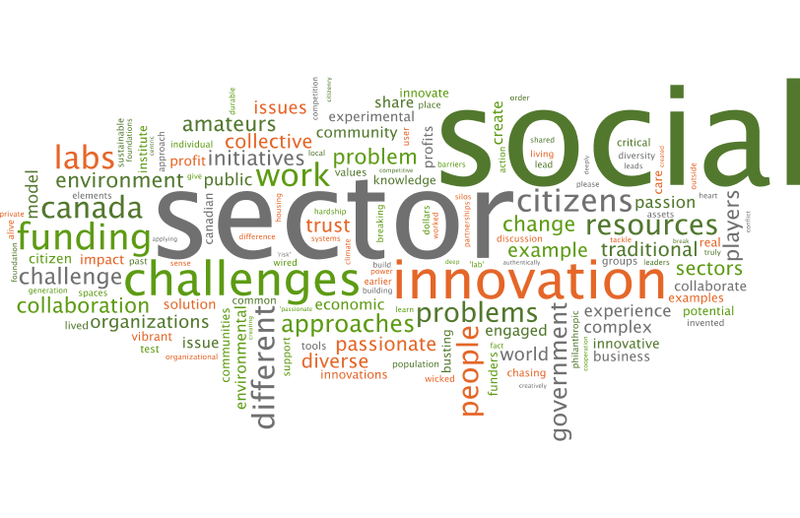 It is fair to say that at this juncture that we are at the beginning of a new chapter in social innovation in the non-profit sector. Fuelled by the revolution in information technologies, Canadian non-profits are exploring how best to achieve their goals and to serve their communities in the 21st century. Social innovation is is impossible without collaboration. This conversation explored what are the new tools and models of organization for collaboration and the critical question of how to scale up and out social innovations from the sector. State of the Art Where have we come from and where are we headed? This session explored where we have come from and where we are going in the social sector. It examined the range of drivers and considerations that now challenge the community sector, including growing inequality and societal diversity, the speed of technological change, and conflicting demands resulting from the contracting out of public services and heightened scrutiny with regard to quality, outcomes, and impact. The Solutions Agenda was a a two-year researcher / practitioner partnership between Community Research Connections and the Sustainability Solutions Group that brought together key actors in community innovations to discuss the solutions to critical sustainability issues. Click on the e-Dialogue theme to download a copy of the conversation. The Future of Work The nature and mode of 'work' has shifted, as we see trends such as growth in the non-profit sector, the building movement around producing open source products, recent rises in volunteerism, and more collective and collaborative work spaces (e.g., the HIVE in Vancouver, the Centre for Social Innovation in Toronto, and HUB Ottawa), which allow people to pursue their work focuses and interests, while still giving them access to social and intellectual capital and diverse networks. New opportunities for engaging in different work modalities and work-lives present themselves, there is increasingly less ‘business as usual’, and more integration of people’s passions, interests, lifestyles and (more critically) their social values a fundamental part of their work. Waste As waste does not exist in nature, with ecological systems continually recycling water, minerals and nutrients through an interplay between sunlight energy, primary producers (e.g. plants), consumers (e.g. animals) and decomposers (e.g. bacteria). Addressing our waste requires us to align with these cycles and engage in a type of production and consumption that will allow for our material outputs to return to these systems as inputs. This includes continually thinking about how to reduce the negative ecological impacts of waste in a manner that is adaptive to changes in technologies, economies and values over time. Communities and regions throughout Canada and around the world are attempting to tackle this challenge by implementing policies and best practices to manage their waste, such as life-cycle management, producer take-back systems, biomimicry, industrial parks, moving to zero waste, landfill gas recovery, carbon restorative buildings and many other innovations. Rural spaces and communities act as the interface between human societies and the natural world, which positions them in a significant societal role, serving as the nexus between human populations and natural places. They have vital functions in harvesting and gathering the natural resources that are distributed to and used by communities of all sizes and urbanity. Hence, cities across the globe are interdependent with rural communities for fundamental needs such as food, energy and building materials for shelter. 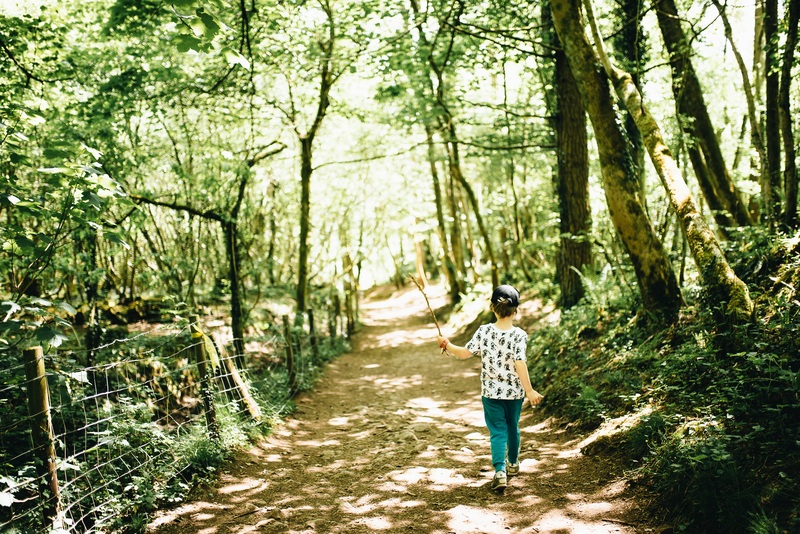 In addition, rural spaces serve as ‘gateways’ to natural environments, meaning they provide important opportunities for people to experience, recreate in, and connect with nature. The UN declared 2012 the International Year of the Cooperative, recognising the contribution of cooperatives to poverty alleviation, employment generation and social integration. But the contribution of cooperatives goes well beyond this. Some argue the model trains people in democracy, others argue the model contributes to peace and still others argue it contributes to sustainable development. Multi-functional spaces integrate multiple uses or functions in overlapping time and space. The multiple amenities offered by through these spaces appeal to diverse community members, including activists, artists, academics and social entrepreneurs, allowing them to act as incubators for new ideas, knowledge exchange, shared experience and experimentation. This connection of diverse communities can inspire innovative thinking and provide opportunities for collaboration across traditional boundaries. The United Nations General Assembly defines the concept of sustainable energy as “energy that is accessible, cleaner and more efficient…and…paves a path out of poverty to greater prosperity for all”. Achieving sustainable energy involves a complex process of developing energy systems in a manner that minimizes environmental and health impacts, creates economic opportunity, and ensures everyone has equitable access to power. Food security, as defined by the World Food Summit of 1996, exists “when all people at all times have access to sufficient, safe, nutritious food to maintain a healthy and active life”. It is an essential component of sustainable communities and food locality contributes to community resilience by reducing vulnerabilities to exogenous shocks.